If you can't already tell, we are huge hearts of palm fans in this house. I had never even tried them until King Hock and I were dating. I was pretty skeptical because the thought of eating the center of a palm tree just sounded repulsive. I remember being on a date at an all-you-can-eat place that had hearts of palm on their salad bar, King Hock thought he hit the jackpot. I remember watching him devour a disgusting portion of them, and thinking "gross!" Finally one day, I decided to stop being stubborn, and try them. Of course, they were love at first bite. Now, hearts of palm are like a drug to me, "I'm addicted and I just can't get enough." (Sorry had to put the lyrics to the song that's stuck in my head right now). The avocado and hearts of palm salad I made tonight, is a great and easy side dish, and it goes with pretty much any meal. Also, it was super refreshing to eat this salad during the triple digit heatwave we are going through. This recipe is very similar to one from Kosher by Design. Serves 4-6. 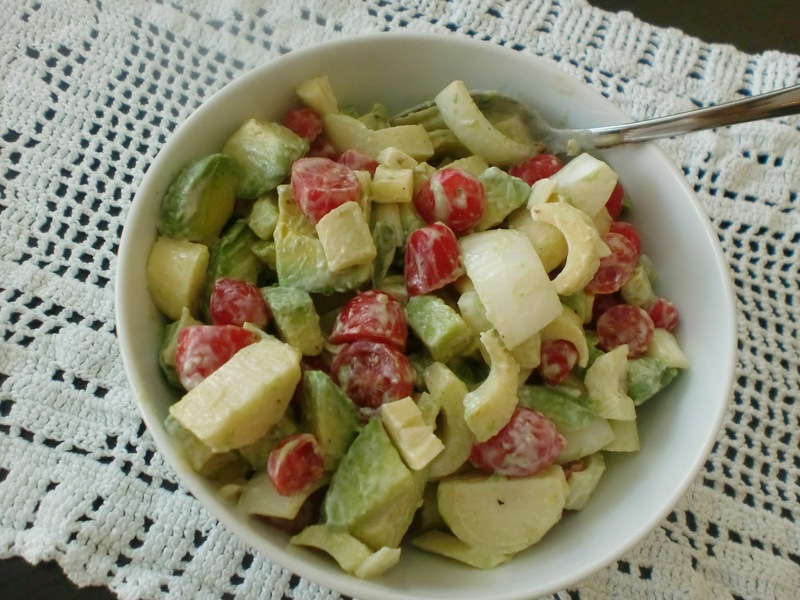 In a bowl place the avocadoes, hearts of palm, tomatoes, onion, mayo, lemon juice, salt, and pepper. Stir to mix. 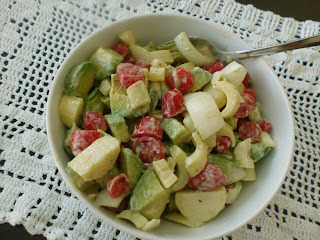 I make the same salad but dress it with olive oil, white vinegar, salt and pepper...amaaaazing!